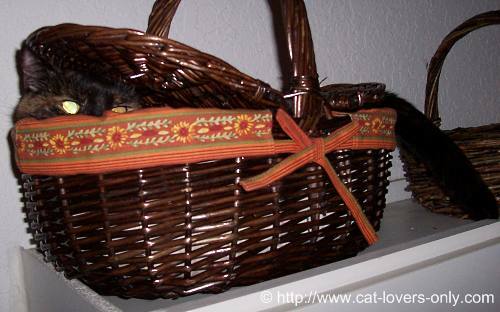 Teddie Monster Cat is Basket Cat. There is no doubt, but before anyone else tries to claim this honor, I just wanted to get Teddie established as the holder of the title. Teddie also aspires to be ceiling cat at times, that's for sure. Like many cats, she loves to be up high. 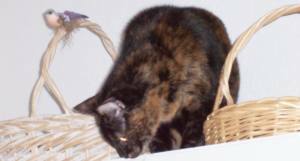 But more than that, and perhaps more than anything else, she loves a basket. She used to love her chair, but the mean humans decided that the chair was way too old and worn out and it had to go. Not to fear, though, as baskets were and are available. A basket up high is irresistible. Give Teddie a basket in a good spot, and she'll happily sleep there for hours. Conveniently, she has baskets at her disposal. So many baskets, so little time.